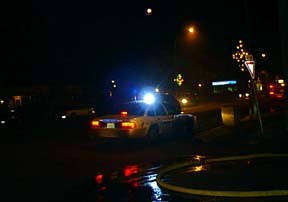 During supper Saturday night the fire alarm sound and Tisdale residents immediately became aware that this was no drill as everyone could see smoke billowing upward from the down town area. 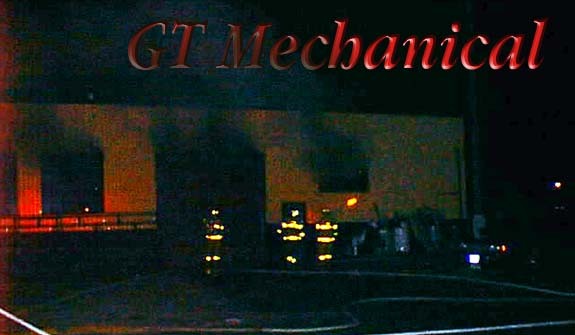 The GT Mechanical shop, across from the town offices had a fire that seemed to have started in the building's South East corner and spread across the ceiling and into the roof. 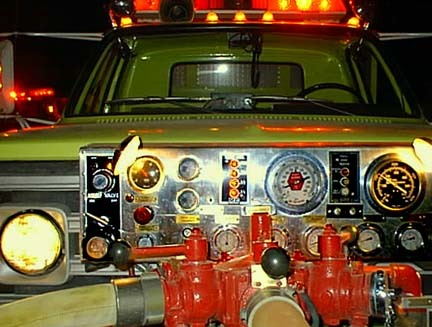 With the fire department less then a block away the volunteer department had their equipment in place and immediately began to struggle with the stubborn blaze. move quickly through the area and of course the heat really builds up at the ceiling. As this is a welding shop there was a serious threat to the firemen with many tanks of pressurised fuels inside and distributed around the work area. 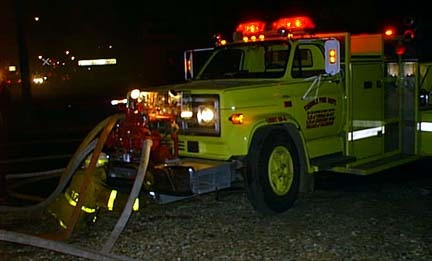 Having excellent equipment and firemen trained to handle that equipment makes the difference between watching a fire and putting one out. The Tisdale Fire Department had the services of two excellent pumpers to give them the water they needed and with four Scott Pac equipped fire fighters they could enter the smoke filled building and cool down the high temperature areas. Using lots of water they were able to extinguish the area where the fire began quickly but the heat had moved across the ceiling and affect the West side kindling material between the ceiling and the roof. About twelve firefighters worked on the fire dragging equipment out of the shop, dashing up and down the ladders and hosing down the smoldering fire that could easily have consummed the building had the fire department not had the jump on it from the very beginning. 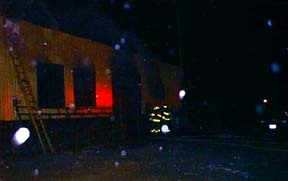 Damage to the structure was confined to the South wall, roof and ceiling along the South side. Damage inside the building will take some time to assess. 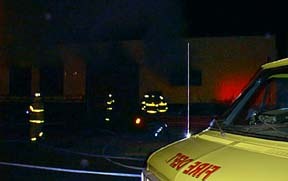 A late model Pontiac is unlikely to be repaired because it sustained such serious damage but most of the heavy equipment in the shop should be unaffected by the fire. 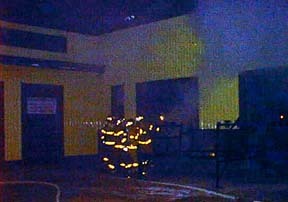 The picture below shows the firemen working at the fire's source very early in their work on the building. Emergency lighting has been set up and the garage door partly opened with crew inside and working from a ladder outside to doast the flames. At this point the ceiling fire in the South West corner has not yet developed. To see more of this story click here to go to the Second Page for more detailed pictures of the fire and the struggle to save the building developed.